"These cookies have a taste very similar to old-fashioned lemon drops." Beat butter and shortening with an electric mixer on high for 30 seconds. Add sugar and lemon peel; beat until combined. Beat in milk. Beat in as much flour as you can, stir in remaining flour. Drop dough by rounded teaspoons 2 inches apart onto ungreased cookie sheets. Bake for about 10 minutes or till edges are lightly browned. Cool on wire racks. Frost with Lemon Cream Cheese Frosting. Store, covered, in the refrigerator. 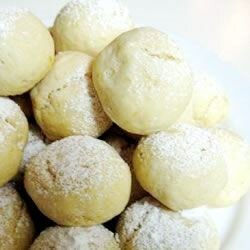 These lemony cookies put a delicious twist on basic cake mix. Good overall, however, without frosting they have a really light flavor. I actually added a little bit of lemon juice and it seemed to help. It's a personal preference thing . . .
Super YUMMY!! especiallly with the lemon frosting!! these little cookies tasted just like the lemon drop candies! Great cookie, awesome lemon flavor! Thanks a bunch!